By Kaya Kizaki and Shiso. Released in Japan by Shueisha. Released in North America by Yen On. Translated by Kevin Steinbach. First of all, you will note the lack of a volume number in the title – this seems to be a one-shot novel. And thank goodness for that. 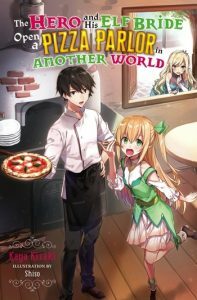 Not that I didn’t find this novel about a pizza hero and his cute, clumsy, and jealous elf fiancee (yeah, they don’t actually get married here) charming, but it’s really the sort of premise that can’t hold up over an extended period. It barely holds up over the course of this book, and it’s a very short book. But on its own, as something you’d read over an hour or so on a train ride or at the beach, it’s perfectly pleasant. The pizza is pretty much the most original thing about it – characters are of the sort that the moment you see their design you immediate know what they’re like and how they’ll talk. And that includes our hero, who is as generic as he appears. But he’s nice. And earnest. He also likes pizza. Our hero is Kaito, a working drudge who is hit by a pizza delivery bike and killed, in the time honored Japanese light novel tradition. He needs a goddess who offers him three worlds he could reincarnate as a hero in – sword master, magic master, or pizza master. Sadly, Kaito is a bit overwhelmed and dithers too much, so the first two options are taken by other dead light novel protagonists, leaving him with pizza hero. (You get the sense that the goddess nudged events towards this happening, and also perhaps nudged Kaito into being a bit more pizza-obsessed than one normally is.) He’s reincarnated in a small town populated by thin elves who eat only vegetables and greens, at the behest of their Queen. Kaito will soon change that… with PIZZA! He’s also given the village leader’s daughter Lilia as an assistant/wife, and while Kaito finds the wife part disconcerting at first, he gradually falls for her. There’s no real satire or deconstruction going on here, I will warn you – everything is pretty much what it seems. Lilia is essentially Index as an elf, with a truly voracious appetite and a tendency to get upset whenever Kaito speaks with any other girl. We also meet the Queen, Eleonora, who is haughty, stubborn, and loves pizza (they ALL end up loving pizza) but needs to keep up appearances. She also falls for Kaito, as does a rich yet ill girl, but given this is one volume and that volume ends with Kaito proposing to Lilia, there’s no real harem action besides “cute girls like the hero because he exists”. The plot is a series of short stories revolving around Kaito making pizza (he gets the knowledge and most of the ingredients via magical cards, with is very convenient) and making elves happy by serving pizza. Even the village-destroying dragon is won over by pizza. Again, this is light, pleasant, and utterly inessential. If you’re looking for a quick read, or like pizza, it’s there for you.